Let your cats go crazy with these unique catnip hearts created specially for Mayhew by Freak Meowt. 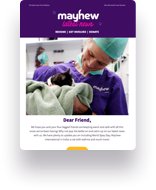 Each heart is beautifully handmade in purple felt and features Mayhew's logo in contrasting lilac. Generously stuffed full of high strength premium quality Canadian catnip, they are purrrfect for your feline friends delectation!